KIEV, Ukraine -- Ukraine on Monday accused Russian army officers of fighting alongside separatists in the east of the country and said Moscow was once more building up its troops on the joint border. Pro-Russian gunmen fire at Ukrainian border guards in the Luhansk region. A missile that downed a Ukrainian transport plane carrying eight people near the border was probably fired from Russia, Ukrainian officials said. President Petro Poroshenko held an emergency meeting of his security chiefs after a weekend of Ukrainian air strikes on rebel positions near the border with Russia and charges by Moscow that Kiev killed a Russian man with a cross-border shell. The war of words between Kiev and Moscow and intense fighting, in which Ukrainian forces say they inflicted heavy losses on the rebels, marked a sharp escalation in the three and a half month conflict in which several hundred Ukrainian servicemen, civilians and rebels have been killed. "Information has ... been confirmed that Russian staff officers are taking part in military operations against Ukrainian forces," Poroshenko said. Poroshenko made similar complaints of Russian incursions on Sunday to the European Union with an eye to pushing the bloc to exert greater pressure, and possibly more sanctions, on Moscow. Poroshenko told his security chiefs that government forces, which lost 23 men in a rocket attack on an army camp last Friday, were now facing a new Russian missile system and there would have to be a change in tactics. "In the past 24 hours, deployment of (Russian) units and military equipment across the border from the Sumy and Luhansk border points was noticed. The Russian Federation continues to build up troops on the border." NATO said Russia had increased its forces along the border and now had 10,000-12,000 troops in the area. Lysenko added three Ukrainian soldiers had been killed and 12 more injured in the fighting in the past 24 hours. Moscow's response to the cross-border shelling and the Ukrainian reports of Russian troops being moved up to the border raised again the prospect of Russian intervention, after weeks in which President Vladimir Putin had appeared intent on disengaging, pulling back tens of thousands of troops he had massed at the frontier. The Ukrainian army said it had broken a rebel encirclement of Luhansk airport on Sunday night. A spokesman for the so-called Luhansk People's Republic said 30 volunteer fighters had been killed in Ukrainian fire on Oleksandrivka, a village to the east of the town, Russia's Interfax news agency said. As military action continued on Monday near the rebel-controlled border town of Luhansk, Ukraine's defence minister said a Ukrainian AN-26 transport plane, taking part in the military campaign against the rebels, had been shot down by a rocket which was "probably" fired from Russian territory. Officials said two crew members, out of the eight people on board, had been in contact with the army general staff and a search and rescue operation was underway. The fate of the other six people was not immediately known. Defence Minister Valery Heletey said the plane had been flying at a height of 6,500 metros (21,000 feet) and was out of range of any weapon the separatists had. "So the plane was downed from another, more powerful rocket weapon which was fired, probably, from the territory of the Russian Federation," he said, according to Poroshenko's website. The rocket may have been a Pantsir ground-to-air or self-guided air-to-air rocket fired from a Russian plane, he said. 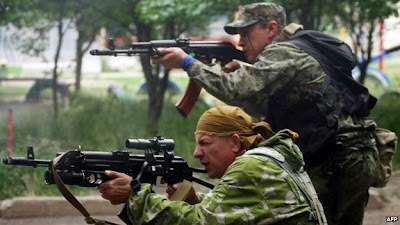 Lysenko said separatists, backed by what he described as Russian "mercenaries", had fired on Ukrainian border guards in an attempt to give cover as armoured vehicles and equipment were being brought into the country. And he again rejected Russian charges that Ukraine forces had fired a shell over the border killing a Russian man on Sunday - an incident that Moscow has described as an "aggressive act" which would have "irreversible consequences". "The (rebel) fighters systematically fire mortars and shoot into Russian territory, which killed a Russian citizen," Lysenko told journalists. Russia said it had invited monitors from the OSCE, a European security and rights body, to visit two of its border crossings with Ukraine as a sign of goodwill. In a weekend of fierce combat, Ukraine said its warplanes had inflicted heavy losses on the pro-Russian separatists in air strikes on their positions, including an armoured convoy which Kiev said had crossed the border from Russia. Poroshenko's office said Kiev would present documentary proof of incursions from Russia to the international community via diplomats. But Russia kept up pressure on Kiev over the cross-border shell incident. A Russian newspaper, citing a source close to the Kremlin, said on Monday that Moscow was considering the possibility of pinpoint strikes on Ukraine in retaliation. Poroshenko on Sunday complained of alleged Russian incursions into Ukraine in a telephone call with the European Union's Herman Van Rompuy. The EU - Ukraine's strategic partner with which it signed a landmark political and trade agreement last month - targeted a group of separatist leaders with travel bans and asset freezes on Saturday but avoided fresh sanctions on Russian business. The conflict in eastern Ukraine erupted in April when armed pro-Russian fighters seized towns and government buildings, weeks after Russia annexed Ukraine's Crimea peninsula in response to the overthrow of a pro-Moscow president in Kiev. The fighting has escalated sharply in recent days after Ukrainian forces pushed the rebels out of their most heavily fortified bastion, the town of Slavyansk. Hundreds of rebels, led by a self-proclaimed defence minister from Moscow, have retreated to the Ukrainian city of Donetsk, built reinforcements and pledged to make a stand. The once-bustling city has been emptying in fear of a battle. Vladimir, a 55-year-old coal miner, was sending his wife with two children to relatives across the border. "The Ukrainians have already cut off water. Electricity is only just working. How can you live without water and light?" he said. The goal of Russia in Donbass region is: to be able to receive low cost product (military equipment for its re-armament). How Russia can do it? Fist, Russian wants for the region to have independence in making deals with Russia. Russia could subsidize gas price for the region only. Second, Russia is trying to keep rebels in the game in the region so, European standards do not effect it. That is the rezone for such argent peace talk at the moment. Germany proved once again its dependents on Russian businesses and its impotency. In addition it is interested in seeing Ukrainian heavy industry to stay not modernized for next 10-15 years.